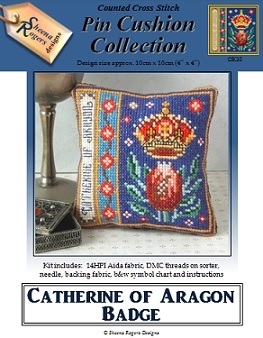 This pincushion design features the Badge of Catherine of Aragon, the first wife of King Henry VIII. The emblem shows a crowned pomegranate, with the crown representative of victory, sovereignty and empire and the pomegranate, being full of seeds, a symbol of fertitility. The design also includes a border of Tudor roses set against a deep Turquoise background, with Catherine's name down the left hand edge, all framed with rich gold and sapphire blue threads.